The design of the AMCA scale model displayed at Aero India 2015 was identical to the design of the AMCA scale model displayed at Aero India 2013. This wasn't the case during earlier shows - Aero India 2011 AMCA design differed from the 2009 design, and the 2013 design differed from the 2011 design. Feature two engines without thrust vectoring, relying exclusively on high power to weight ratio for super-maneuverability. Not have all aspect stealth - engine nozzles are not shaped, though ADA intends to minimize IR signature of the engine exhaust. Be a single seat fighter. ADA is all set to roll with the AMCA project, but the IAF isn't impressed with the aircraft's current feature set. The service has drawn up very detailed and ambitious PQSR which includes all aspect stealth, super-maneuverability through thrust vectoring and twin seats. 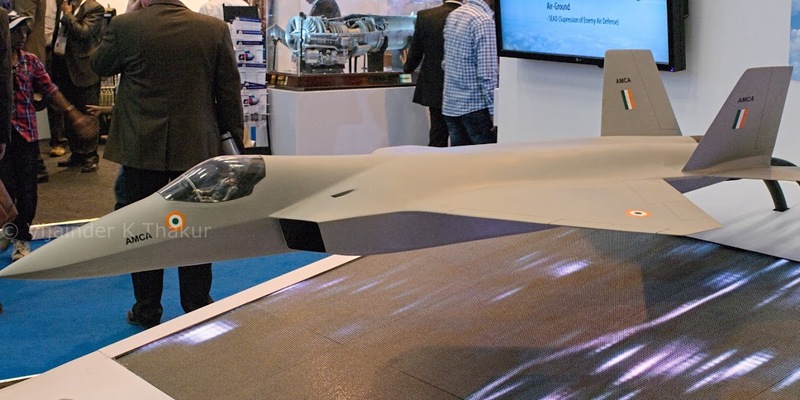 ADA is confident that it can redesign the AMCA for all aspect stealth, twin-seats and thrust vectoring, but points out that these capabilities would push up costs and stretch timelines. ADA is in the process of responding to the IAF PSQRs with feature wise cost and time frame implications. Thrust vectoring is likely to be conditional on Russian willingness to transfer technology. In view of the differences between ADA and the IAF, it maybe a while before AMCA staff requirements are finalized. Hopefully, the IAF will challenge ADA with realistic performance and timeline requirements, not doom the project by asking for the moon as it sometimes tends to do. Meanwhile, IDP sentinel has learn't that LRDE has been tasked with developing a conformal X-band AESA for the AMCA, which means that the pilot will be able to track and engage threats not just in the front quarter, but also on either side. Clearly, it's not just the IAF that needs a reality check.